I began investing in earnest in early 2009. Prior to that I didn’t have a real strategy aside from a general proclivity toward saving money while not spending frivolously. I had begun prior to 2009, however, to research what would eventually blossom into the dividend growth investing (DGI) strategy that I now follow. For the first few years of my investing journey, I would perform research on a stock, invest some cash, and then just collect/reinvest the dividends as I went. From there, I eventually found that it would be worthwhile to track my progress using an Excel spreadsheet. While I wasn’t sure whether this was purely for academic reasons at that stage or whether it would yield fruit, it seemed nevertheless like a prudent thing to do. Building off of that base, and from the beginning of 2018, I have released monthly portfolio updates which detail my dividend income and market activity over a given month. Doing this has kept me focused on my portfolio and excited to make new purchases, knowing that doing so would eventually lead to bigger monthly updates in the future as the dividends begin to be paid. Although tracking my monthly dividends from 2018 was great, I still felt something was missing. I realized this as I looked out at the wide world of dividend growth investors on the blogosphere and saw that some of them actually had some pretty outstanding graphs based on historical data from their portfolios. It occurred to me that the real benefit of having data is in the aggregation of it to draw meaningful conclusions. Or, at the least, to use the data to gain a better understanding of what it represents. Fast forward to this weekend and I decided that it was time to take a walk back through my dividend investing history and go through the exercise of charting my own progress from a neophyte to the full-fledged investor standing (writing) before you. As noted, my DGI journey took off in early 2009 with my purchase of Toronto-Dominion Bank (TD). As such, the first activity comes in July 2009 when TD paid me its first dividend–the first dividend I had ever received from a single company, though my prosperous relationship with the company has only grown. I intend to include a snippet of the graph with each subsequent monthly portfolio update. Allowing those who read my articles to witness the progression in such a tactile way permits them to better understand whether a given month was a step in the right direction or whether I lagged based on my historical results. I am on track in 2018 to have, by far, my best year ever in terms of absolute dividend growth. Although 2016 was a very solid year, I have set a new standard that I hope to continue pushing moving forward. It isn’t in the books yet, but December of this year is on pace to bring in well over $550 in dividends. That would amount to more than all of 2010 combined. In other words, in one month, I stand to earn more than I brought in through the twelve months experienced in my first full year of investing. If nothing else, this surely represents the strength of the DGI strategy and the importance of reinvesting dividends along the way. The snowball of dividends takes time to grow, and once it does, it becomes a real force to be reckoned with. The Feb-May-Aug-Nov dividend payment schedule is pitifully weak–only more so since Jean Coutu was absorbed into Metro, Inc. (MRU). With that said, I recently added shares of AbbVie Inc. (ABBV) which will help boost my payout in those periods. I will detail that purchase a bit more closely in the pending November 2018 Portfolio Update article. I haven’t had time to truly digest the chart at this stage and so I will refrain from making detailed projections several years into the future. With that said, I believe having this to rely on will make forecasting simpler going forward. I have committed more seriously through 2018 to the development of my portfolio. Namely, I have been more diligent with adding fresh capital and to also deploying my investable funds rather than letting them sit dormant just earning interest (or not). I paid my truck off earlier this year which means I have another $260 bi-weekly which can be funnelled toward my portfolio. Taken in annual terms, that is nearly another $7,000 that I can put to good use. 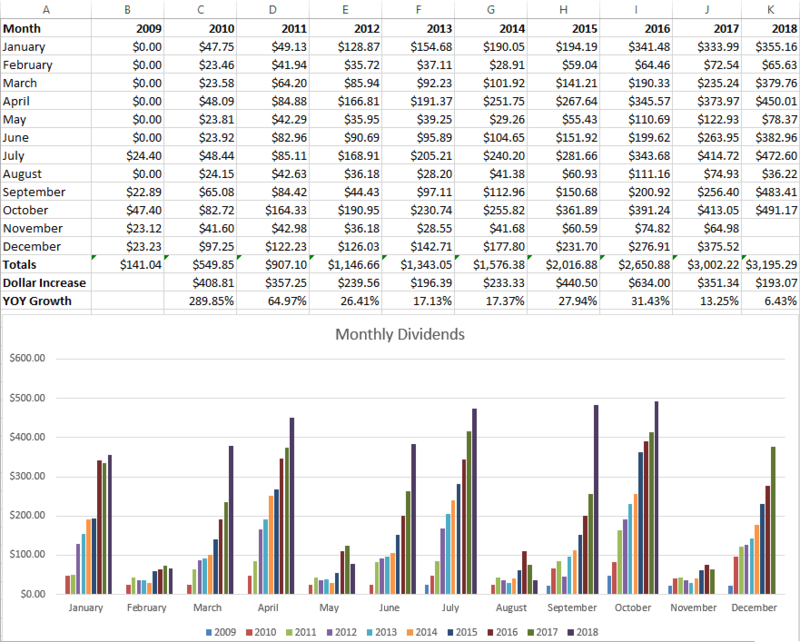 Tracking dividends on a monthly basis this year has been incredibly beneficial for me. It has encouraged me to stay on track and remain consistent as an investor. Taking the time this weekend to actually put everything into a single graph has provided a useful lens through which I am able to view historical trends on a more granular level within my portfolio and by which I will be able to forecast into the future with greater efficacy. Just as online games and social media use pings, alerts, and point systems to drive user engagement, being able to see my progress so easily just leads to a virtuous cycle where I want to continue doing better and getting that “hit” of dopamine as my performance improves. I hope that seeing my progress motivates others to follow this strategy just as reading other bloggers did the same for me. How do you go about tracking your progress as an investor?